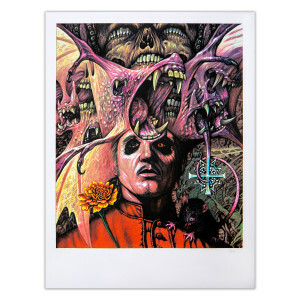 5th bonus print featuring an original, commissioned work by heralded artist Marald van Haasteren. Created in colored pencil and acrylics, the 5th print is inspired by the Black Death plague, a major theme on Ghost’s new album Prequelle. Van Haasteren is known throughout the heavy music community for his stunning artwork for acts like Baroness, High on Fire, Kylesa and many more.